I love stouts and porters, and chocolate and coffee, but I find most chocolate and coffee stouts a bit disappointing. Brooklyn's chocolate stout is way too overpowering on the chocolate, and it's so thick and sweet, I can only drink 1. 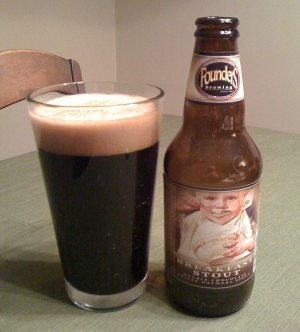 I haven't had Founder's, but most coffee stouts are the same thing, big coffee flavor that distracts from the actual ale. An exception, I think it's Troegs that makes a java porter that finds the right balance for an absolutely amazing beer. Oh, and have you seen the original Tron? I tried to watch it on TV a few years ago, figuring it will be so campy it will be fun. Nope, it was just all around awful, I turned it off after about a half hour. I hope the new one is at least better than that. Neither Tron movie is particularly good. I like them both, but they're clearly flawed. I think that iRi review I linked provides an interesting perspective on why I like them, even if, again, they're not especially good in any other respect. Also, the original seemed to be kinda prescient in terms of the way we look at computers and networks. The new Tron is very lame in that respect. Think of all the changes in computers and networking since 1982 (or whenever that first movie was). More complex, faster, huge networks, the internet, etc... None of that is even remotely touched on in the new movie. This page contains a single entry by Mark published on January 16, 2011 10:55 AM. La Trappe Quadrupel was the previous entry in this blog. St. Bernardus Witbier is the next entry in this blog.